I am so sorry to report i heard today that Dr.Ken Leistner has passed away. At the moment i have no more details and got this from Iron History Forum. Opinionated and passionate he often ruffled feathers but made no apologies for who he was.That he contributed much to the world of strength and conditioning is without doubt.Rugby,judo, American football, Olympic lifting, powerlifting were just some of the activities he was involved in in his long career, as participant, coach and promoter.He was also active in many ways for the good of his community and worked as a Chiropractor.He was a prolific writer on all the subjects he had interest in especially the world of strength. For a time he put out an excellent newsletter called the Steel Tip, which was chock full of sound training advise.Always having a home gym where many benefited from his expert guidance, for a period he was also co-owner of the Iron Island Gym on Long Island, New York. After Hurricane Sandy devastated Long Island, Dr.Ken and his wife Kathy worked tirelessly in their community to help those in need.One of their projects was caring for displaced kids barracked in a church hall. I sent Ken some clothes and a check and thought no more of it. A week or so later i received a hand written note thanking me for the donation.That shows the measure of the man, who despite working round the clock helping others he still made time to write to me and possibly many others in gratitude. I wish on the behalf of HOPC to offer sincere condolences to his wife Kathy,family and friends.May he now rest in peace. Re: DR.KEN HAS LEFT US. I'm sorry to hear that, Peter. Rest in peace Dr. Leistner and Godspeed to you good sir. May God bless & comfort all of his family & friends. Just been reading some of Dr.Ken's articles again. Always enjoyed his no nonsense approach to training. Thank goodness he has left so much of value for future generations,if they are prepared to listen that is.He certainly lived a full life and although his sudden death is so difficult for those left, one can be sure Dr.Ken would never have wanted to be an invalid. 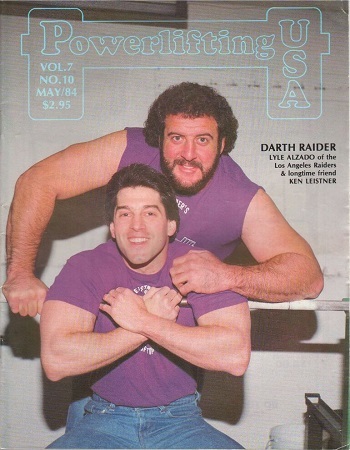 Forum member Jim Duggan wrote a very nice memorial for Ken which can be read on Bob Whelan's Natural Strength site. It seems like his qualities as a strength expert were exceeded only by his qualities as a person. His generosity, interest in others, kindness, and devotion to his family and friends all played a role into making him into someone to be, rightfully, admired and respected. I'm sure I speak for many people when I say that I shall miss him. But his spirit will live forever in the hearts and minds of those of us who looked up to him. Bob Whelan had asked me to write something for his website. Hi Jim, thanks you for writing this nice tribute to Dr.Ken and for sharing it with us at HOPC. Very nice tribute to Dr. Ken, Jim! Bravo and thank you for sharing it here! His 400lbs for 23 reps! Sorry to hear that he passed. SLDL 347lb x13, this was done standing on a block so the bar touched his instep. log roll up and push press 216 x3. shrug 347lb x13 using straps. Nautilus pull over 160lb x9 slow negative. shrug with two 119lb farmers walk handles x11. barbell curl 154lb x4 strict,2 cheat with slow on the negative. Pretty intense when you also realize he was only weighing around 160lb at that time.Took around 30 minutes of solid concentrated work.